The items in the Presta Ultra 2 Step® Buffing System MaxCut™ Shop Pak take you through complete paint refinishing after sanding - from compounding to polishing to protection. Ultra 2 Step MaxCut Compound, 32 fl. oz. 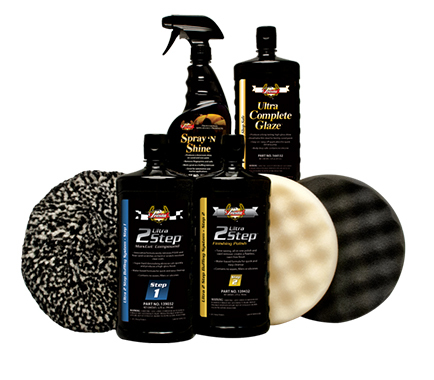 : The newest, most innovative compound in the Ultra 2 Step Buffing System. It is engineered specifically to remove P1500 and finer sand scratches on difficult clear coats such as fast-drying production clears or low VOC clears. Water-based formula contains no waxes, fillers or silicones. Ultra 2 Step Finishing Polish, 32 fl. oz. : Advanced all-in-one polish and swirl remover. Designed for use on both new and aged clear coat painted surfaces. Creates a rich, deep gloss and a swirl-free finish in a single step. Ultra Complete Glaze™, 32 fl. oz. 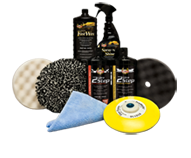 : Durable, yet breathable body shop safe paint protection that is easy-to-use and won’t cause solvent pop. Provides a high-gloss shine with up to 30-days protection. Spray 'N Shine™, 22 fl. oz. : Removes smudges, fingerprints and dirt to leave an attractive shine on any non-porous, painted surface with this easy-to-use appearance enhancer. Also works great as a lubricant with overspray clay or during buffing when the compound, polish or pad gets too dry.